The second page of our March 'Can You Help?' 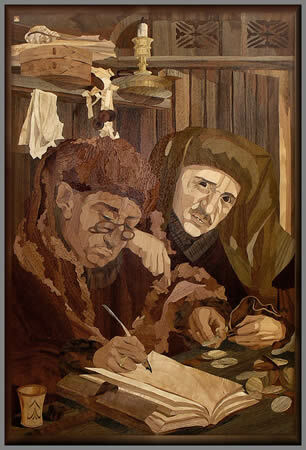 update brings some very interesting marquetry pieces that, we hope, you may be able to help us in identifying. Hopefully you may recognise them, or their style, and may therefore be able to shed a little light on their origins and/or their maker's names. 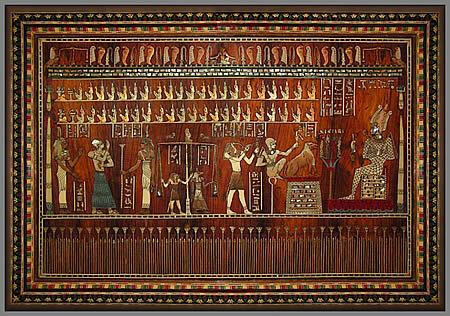 The uppermost, or top picture in this trio features an ancient Egyptian themed marquetry picture that was found in a second hand (or 'junk shop') several years ago, and was purchased for a nominal amount. The picture measures 20 inches height by 29 inches width (that is 51cms x 74cms metric). As well as the normal veneer format, this picture also incorporates lustrous pieces of mother of pearl, some semi precious metals and a modicum of natural ivory. The background veneer looks very much like it could be Padauk. The grain pattern and figuring suggest that it is the Andaman variety from, naturally enough, the Andaman Islands. The scientific name of this veneer being 'Pterocarpus dalbergiodes. If you can help us out with some information on this unusual marquetry picture, such as when, where, or by whom it was made, we would, of course, be very indebted to you. Just click the link in the box to the right, or use the address at the bottom of the page to send us an e-mail with your valuable information. Thanks for your help. 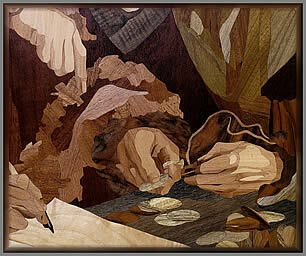 The two pictures entitled "The Money Lenders" were sent in to us several months ago. Unfortunately, the sender's details were lost when the server we were storing them on crashed and deleted the open files. As luck (or should we say 'bad luck') would have it, one of those open files happened to be the text that accompanied these pictures. For some inexplicable reason, the file hadn't yet been backed up, so, sadly, we lost all of the descriptive and general information that went along with these pictures. If you can recognise them, or have some information that could be helpful, would you like to consider sending us an e-mail to enlighten us, and enable us to update our information so that we can have an accurate record for our archives. Once again, thanks for any help you are able to send us. It is very much appreciated by everyone here on the editorial team. Click the above button to return to page 17 of "Can You Help"
Click the above button to visit page 19 of "Can You Help"